In the following review I’m going to show you one of the best multilingual plugin available for WordPress. You´ll learn everything you need to know to use it and why I bought it and use it on many multilingual projects. WPML is a commercial plugin, designed to make it extremely easy for you to create a WordPress site in several languages. You can have your web site based on WordPress in other languages like Russian, Spanish, Italian, French, Dutch, Chinese, and many more. The default install is available in over 40 languages. Also, it is possible to add your own language variants using their languages editor (e.g. Mexican Spanish or Canadian French). Simple setup. A simple setup wizard lets you configure WPML and turn your WordPress website multilingual in a few minutes. Add languages, choose language selectors and start translating. Easy of use. This plugin makes content translation easy. You can translate yourself, you can work with a team of translators. Technical support. They give native-language support in 7 languages. Reliability. WPML has been around since 2007 and powers over 400,000 commercial sites. You will always receive updates before WordPress versions arrive. Multilingual SEO. This plugin is great for Search Engine Optimization. 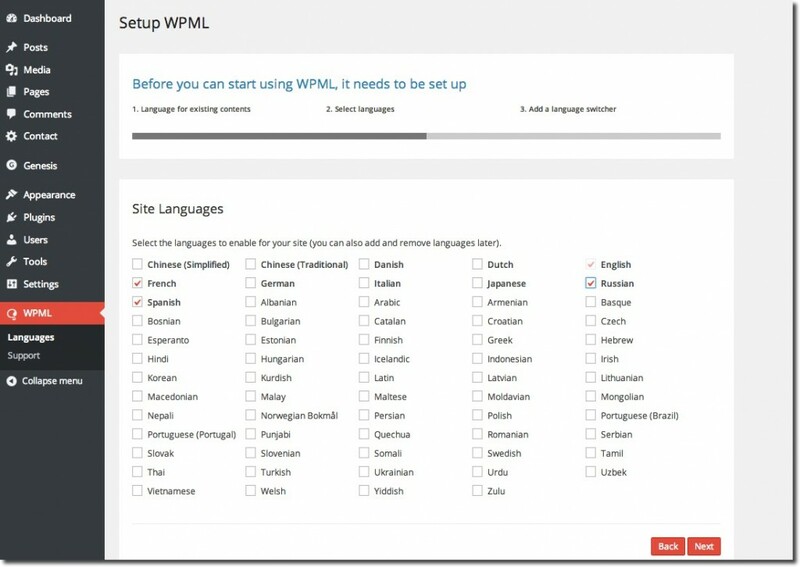 WPML lets you do SEO for each language. You can set SEO features for the homepage, categories and internal pages, letting your sites rank high on local search results . WPML is fully compatible with SEO plugins: WordPress SEO by Yoast, All in One SEO Pack, etc (Article: Using WordPress SEO by Yoast with WPML). Domain / Subdomain / Subdirectory. Translations appear in their unique URLs and you can put different languages in completely different domains, subdomains or subdirectories. E-commerce. WPML enables multilingual e-commerce. You can run e-commerce sites with WPML and WooCommerce. Price. WPML is a commercial plugin and it costs money: $29 on the Multilingual Blog version (annual renewal costs $15) and $79 on Multilingual CMS version (annual renewal costs $39). If you want to purchase a perpetual license must pay $195. However, the license is offered for unlimited sites. Also, you can request refunds until 30 days of your purchase date. They will refund 100% of your payment – no questions asked (Refunds Policy). Performance. WPML has a lot of features that help you manage your multilingual site, but also require database resources to run. Sometimes this plugin can slow the admin panel but not your website. By getting WPML, you actually get a suite of plugins that makes it easy to build multilingual websites with WordPress. WPML Multilingual CMS is always required, but you can install any combination of the add-on plugins for additional functionality. WPML Multilingual CMS. The core plugin. It´s always required. It adds the basic translation controls and allows translating content. WPML Media Translation. It allows using the WordPress Gallery in different languages. You can control which images will display for each language. WPML String Translation. This plugin allows to translate interface strings without having to use .mo files. It lets you translate texts that are outside of posts and pages (for example, the tagline and SEO data). 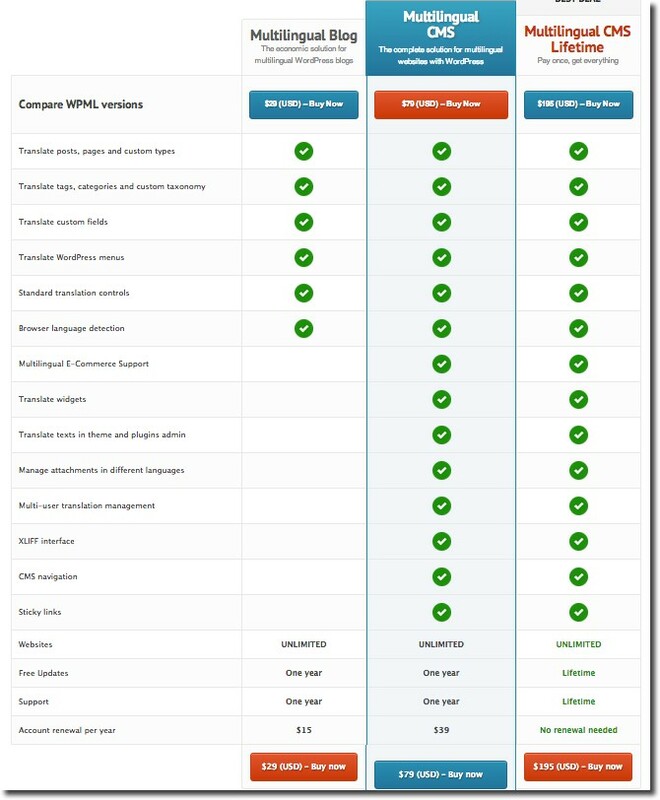 WPML Translation Management. 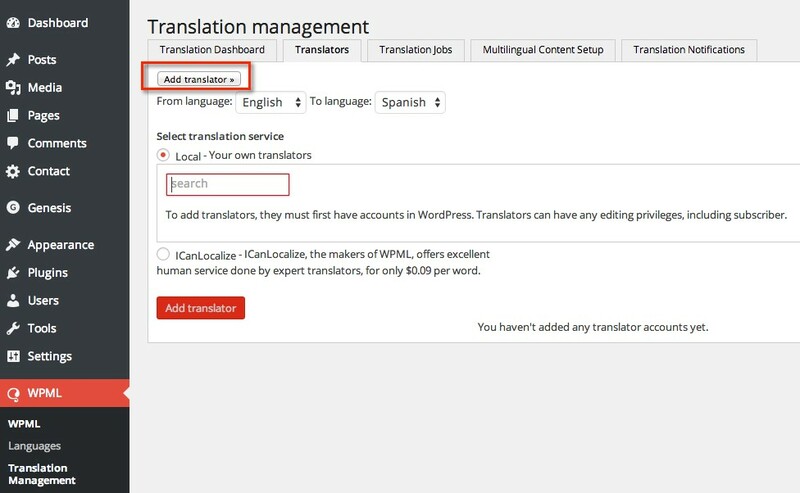 This plugin plugin helps webmasters manage their translation work. They can turn normal users into translators, send jobs to translators and track progress. WPML Translation Analytics. This module allows you get concise reports about the current status of your site’s translation. WPML XLIFF. You can send content to freelance translators using the standard XLIFF interface. WPML Sticky Links. This add-on plugin keeps internal links from ever breaking. WPML CMS Navigation. This plugin adds navigational elements which you can use when building the site: breadcrumbs trail, sidebar navigation and drop-down menus. First of all, you’ll have to add languages. A simple setup wizard lets you configure the plugin. 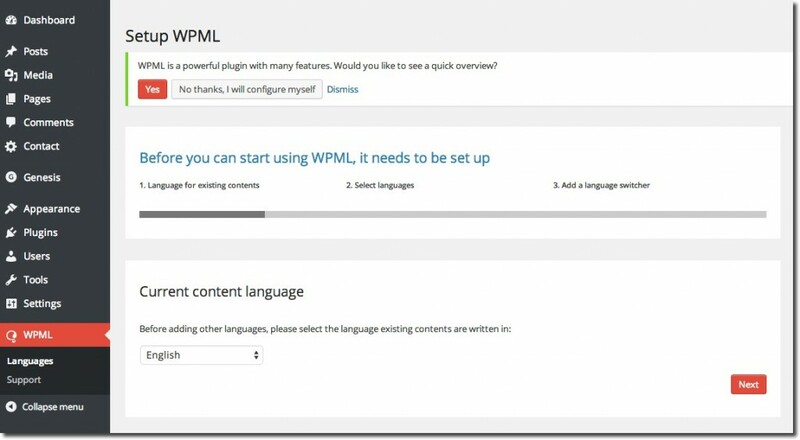 When you configure WPML, you need to choose the language of existing content and then, add more languages to the site. If you need to use a language that doesn’t appear on the list, you can create it, clicking on “Edit languages”. To let visitors select their language, you must add a language selector to your theme. 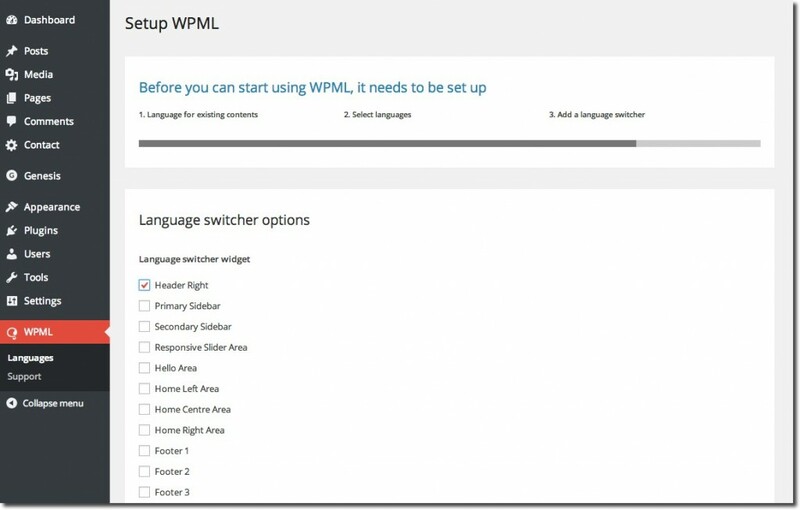 WPML’s standard language switchers include a drop-down languages list, a language switcher in the menu and a list of languages for the site’s footer. You can choose what to include in the language switcher: a country flag, the language name in the page’s language or the native language name. You can choose colors for all parts of the language switcher. Also, you can control the order in which languages appear in the language selector. Drag the languages around to change the order. Subdirectories (wplang.org/es/ for Spanish and wplang.org/de/ for German). Create translations using the standard WordPress editor. When you click on the ‘plus’ icons in the posts or pages list, a new post or page opens in the new language. This way, you can enter the translation, just like you create the original content. 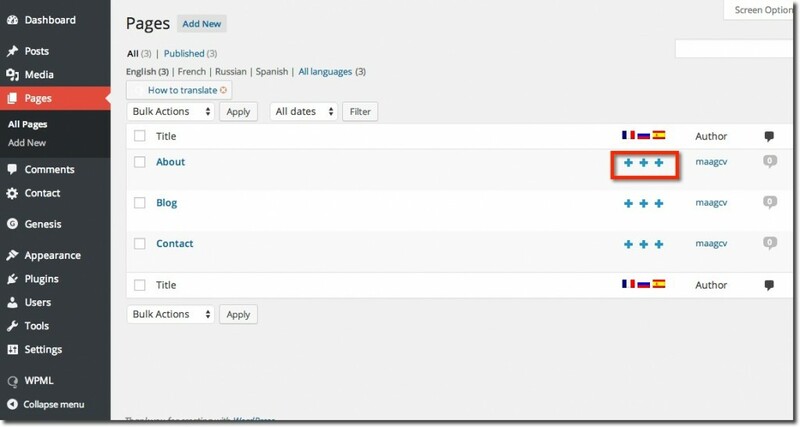 This plugin allows webmasters to determine which users will translate each content. Translators can have any type of account, including even subscribers. They will use WPML’s translation editor. If your translators are using Computer Assisted Translation (CAT) tools, you can send them translation jobs. Your translators will receive XLIFF files to edit (XLIFF module). 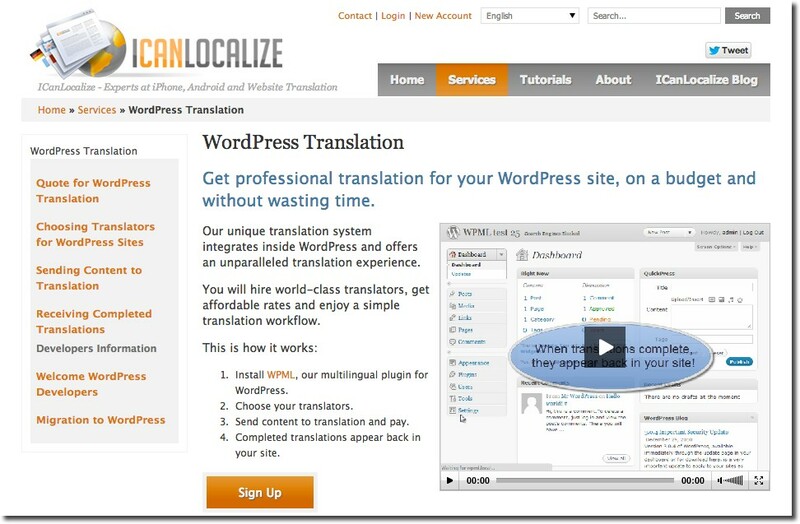 ICanLocalize offers professional translation services within the WordPress admin dashboard (of course, you need WPML). You can receive a translation quote (about $0,09 / word), choose translators, send content for translation and get them back, ready to publish. You can find translators to over 30 languages. Multilingual CMS package: $79 (annual renewal costs $39). The Multilingual CMS Lifetime ($195) also includes all of WPML’s components, but gives you lifetime of updates and support, without ever having to pay for renewals. IMPORTANT: The license is offered for unlimited sites. As mentioned earlier, the Multilingual Blog package will give you the most important components. However, if you want to build a professional multilingual WordPress site I highly recommend purchasing the Multilingual CMS, as you get full features. It allows you to translate every element of your website. Your clients will be able to use WPML’s advanced translation management capabilities. WPML is probably the best option to work with multilingual WordPress websites. WPML has the support of a company and a team of professional developers. You won’t have to worry anymore about support and updates. I use this plugin on many projects. On the other hand, WPML is a commercial plugin and it has to improve some performance issues. That´s the reason you should consider using WordPress Multisite for large websites. If you’re not sure if this plugin is for you I recommend you test it. You can buy it and request refunds until 30 days of your purchase date. They will refund 100% of your payment – no questions asked (Refunds Policy). If you have any questions you can ask in the comments section. I’ll update this review periodically. Irena is the creator of the blog WPLANG (WordPress Multilingual) and a professional specialized in website localization. Irena now helps others to create a WordPress website in one language or create a multilingual WordPress website.